Ah, that minty new-set smell! 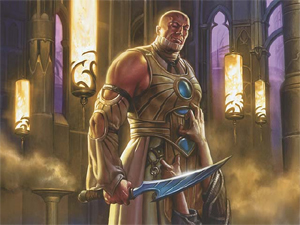 Ravnica: City of Guilds brought some sauce to the table, but it's now time for the next course. Just in time for the Limited PTQ round. You know how in Ravnica sealed deck, you tend to build red-white-green or blue-black-green most of the time? And how in Rav-Rav-Rav drafts there are like only four major archetypes and everyone knows how to draft all of them by now? 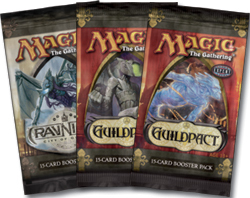 Guildpact has the highest density of gold cards per pack of any set we've ever made. The new guilds we're introducing have their own agendas, their own mechanics, and they will not be ignored. Much mixing and matching will be done in forty card decks over the next few months. It should be a wild ride. In Constructed, the new guilds should get some breathing room and be able to show off their own wares without interference from the Ravnica four. Or, again, there could be much mixing and matching thanks to all the mana fixing at your disposal. Just think, you could build a black-green-white deck with twelve painlands and twelve Ravnica duals. Of course, you'd probably do sixteen damage to yourself over the course of the game, but you can see where I'm going with this. Things are about to get crazy. You've seen some sick ones from the Gruul and Izzet guilds so far in this week's previews, and Teysa, Orzhov Scion gave you a glimpse into the gothic world of the Orzhov. But what is Orzhov's modus operandi, at least in a mechanical sense? In their day-to-day dealings, the Orzhov guild is very grounded, handling (in their own corrupt way) most of the trading and business deals taking place in Ravnica. 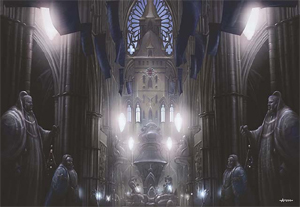 But they are a very spiritual guild with strong ties to the supernatural—their guildhall is a church and their leader is a council made up of long-dead ghosts. It is that mysticism that the haunt mechanic brings to life. The mechanic works like this: each haunt card has the potential to generate its effect twice in the course of a game. The first effect happens normally the first time you play the card—instants and sorceries with haunt “do their thing” just like any other spell would, and creatures with haunt all have comes-into-play abilities that trigger. Then, once the card with haunt goes to the graveyard—for instants and sorceries that's right away, when they resolve; for creatures, it's when they die—the haunt card gets removed from the game and “haunts” a creature in play. Then when the haunted creature dies, you get the haunt card's effect again. Yes, it may take a while for some of these cards to go off twice, especially if your deck isn't specifically tuned to make use of the mechanic. What can I say; the Orzhov spirits are very patient! Most haunt effects are pretty simple—discard a card, drain two life, destroy an enchantment, and so on—but some of the rare cards, like our friend the Orzhov Pontiff, have slightly more complex effects. When the Pontiff first hits the table, you can either beef up all your own guys or weaken your opponents' forces (and probably kill a few stray saprolings while you're at it). When the Pontiff dies, he'll haunt something else in play (which can be your creature or your opponent's, by the way), and when that creature dies, you'll get to choose which effect happens again—+1/+1 for your guys, or -1/-1 for theirs. It may sound a bit complicated—and it is—but the play decisions it creates are myriad and all very interesting. And the card is powerful to boot! The minus ability is very potent against many popular decks these days (including those with Meloku and Sakura-Tribe Elder), and the plus ability can really up your damage output. Throw this guy in a deck with a few Nantuko Husks and other haunt cards and your opponent's head will be spinning. Haunt was quite difficult to arrive at as the black-white guild mechanic. The set's “red” guilds brought with them a natural duality—Izzet loved spells, and Gruul was all about the badass creatures. Their mechanics—the spell-based “replicate” and the creature-riffic “bloodthirst” (previewed next week) emerged quickly in our design discussions. But black-white was harder. We tried a lot of trading and mercantile flavored mechanics, but those were really wordy and didn't fit in well in a game that was supposed to be about attacking and killing—this isn't Settlers of Catan, people! We then went down an “oppression” path, trying the Orzhov out as a very prejudiced guild that could aim their hatred at one specific color or enemy guild, chosen when the game began. That mechanic was very swingy and proved too devastating against any deck that was trying to be focused. After many weeks of struggling for an answer, I went home and dwelled on the nature of the Orzhov. Yes, they were traders and merchants, but that wasn't cutting it. What about them was appealing? I really enjoy their “look and feel”—very gothic and creepy with supernatural and religious overtones. How could that work on cards? If you can fight your way through that reminder text, you'd see that this fellow would be really hard to deal with via anything other than mass removal. And if you had two of them alternately haunting one another, you'd have a nasty loop that could block all day long or provide an infinite amount of food for the aforementioned Nantuko Husk and his friends. But at least the core of the idea was decent. From there both the design team and the development team tried out all sorts of tweaks. We flip-flopped between only being able to haunt your own guys to being able to haunt any creature in play. We tried having different effects on the “haunt” part as opposed to the normal part of spells. All the creatures didn't start out with comes-into-play effects. In the end, because the mechanic is harder to grasp than most of the others in the block, we opted for a simple, uniform execution. All haunt spells work the same way, and all haunt creatures work the same way. That's not to say we can't revisit the mechanic in the future with all the interesting twists we (and you) can imagine—that's the fun of not using up all the design space at once! And besides, I'm sure you'll agree with me that the haunt cards we made are plenty awesome. Haunt is an ability that lets your creatures and spells have bonus effects from beyond the grave. Only cards from the Orzhov guild (white, black, or white-black) have haunt. 502.51a Haunt is a triggered ability that enables other triggered abilities to work from the removed-from-the-game zone. "Haunt" on a permanent means "When this permanent is put into a graveyard from play, remove it from the game. As long as this card remains removed from the game this way, it haunts target creature." "Haunt" on an instant or sorcery spell means "When this spell resolves, remove this card from the game. As long as this card remains removed from the game this way, it haunts target creature." 502.51b Cards that are in the removed-from-the-game zone as the result of a haunt ability "haunt" the creature targeted by that ability. When the creature that's being haunted is put into a graveyard, an ability of each card in the removed-from-the-game zone that's haunting it will trigger. 502.51c If a creature that's being haunted leaves the in-play zone, it stops being haunted. * If an instant or sorcery spell with haunt is countered, its haunt ability doesn't trigger. * Instants and sorceries with haunt have the same effect when they're played as when the haunted creature is put into a graveyard. Creatures with haunt have the same effect when they come into play as when the haunted creature is put into a graveyard. * You may haunt any creature in play, regardless of who controls it. * The same creature may be haunted by multiple cards. * The cards that are haunting a creature don't return from the removed-from-the-game zone when that creature leaves play. * If there are no legal targets for the haunt ability, the card with haunt stays in the graveyard rather than being removed from the game. * If a card with haunt is removed from the graveyard in response to its haunt ability triggering, the haunt ability will resolve. But since the card can't be removed from the game, it won't haunt the target creature. * The same applies for a token creature with haunt or a copy of an instant or sorcery spell with haunt. The haunt ability will trigger and target a creature in play, but the token or spell copy will have vanished from the graveyard by the time the ability resolves. It can't be removed from the game and won't haunt the targeted creature. 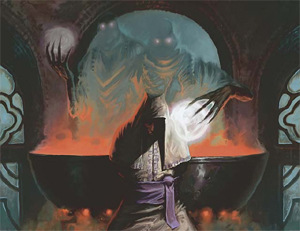 * If a card that's haunting a creature leaves the removed-from-the-game zone due to a Wish (from the _Judgment_(TM) set), that card stops haunting that creature. * The source of an ability that triggers when a haunted creature is put into a graveyard is the card with haunt in the removed-from-the-game zone. The ability is controlled by the owner of that card. * If a creature with haunt controlled by Player A but owned by Player B is put into a graveyard, Player A controls the haunt triggered ability. That player chooses the target for the haunt ability and must remove the card from the game. However, when the haunted creature is put into a graveyard, Player B will control the triggered ability of the card in the removed-from-the-game zone and will make any choices it requires. I've been having some fun lately with an anagram-making website lately. Did you know that “Aaron Forsythe” is an anagram of “Honorary Feast?” Break out the good silverware! Just for kicks, here are anagrams of ten card names from Guildpact. A fun puzzle for no purpose other than being a fun puzzle (and in lieu of a poll, I suppose). I chose cards that have names made up from real words—these shouldn't be too tough to crack. Others use good old-fashioned Magic words that you never heard before and aren't in any dictionary. Good luck with those. If you think you've figured some out, post on the boards! Do you already know which three color-combinations (guilds) are showing up in Guildpact? Well, that's 7 or so percent of you that have been living under a rock! Hopefully that number will go down for Dissension.